Do you need to generate Excel spreadsheets on your server on a monthly basis? Do you need to create Excel spreadsheets on your web server on the fly? Do you need to take the data in your database and put it in an Excel spreadsheet for your clients? And do you want to write source code that does that just as easily as using Excel? SpreadsheetLight makes it easy for you to create those spreadsheets. You can write code that does most of the common Excel tasks with SpreadsheetLight as easily as using Excel itself (usually with only a handful of lines of code!). You also get full library source code, so you can quickly create custom functions without waiting for technical support. Or you know, you’re just plain curious (that’s fine too). SpreadsheetLight comes with perpetual royalty-free licensing, so you don’t have to worry about renewal fees. Check out the sample source code! 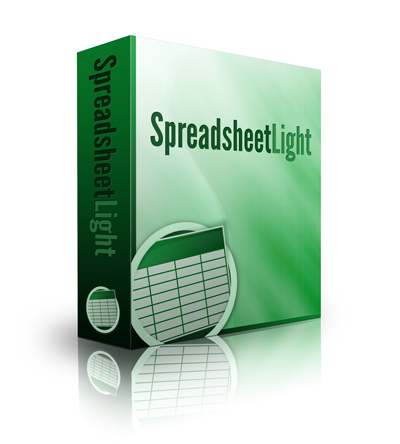 SpreadsheetLight is a spreadsheet software library that’s built on .NET Framework and the Open XML SDK from Microsoft. Simply add the SpreadsheetLight library and the Open XML SDK to your software project and immediately start using it. There is no crippling of feature sets and you don’t need someone to send you an unlock code. Straightforward adding to your project and continue forward with a minimum of fuss. You get extensive documentation of SpreadsheetLight so it’s easy to figure out what to do and how to do them. There’s also a quick-start guide so your programmers can start generating spreadsheets within minutes. *Technical: Most standard functions of generating spreadsheets can be accessed through one class, so your programmers don’t have to search around the library and waste time. Comprehensive styling abilities from font colours to gradient background fills. Support for named cell styles. Easy rich text formatting within a cell. Support for built-in or custom-created themes. Row/column inserting and deleting, while correctly modifying all your merged cells, formulas, tables and defined names. Freezing and splitting worksheet panes. Extensive post-insertion picture abilities from fills and outlines, to perspective shadows, to 3D rotations. Sort cell data by column and by row. Set conditional formatting (data bars, color scales, icon sets and cell highlighting galore!). Pay once, use forever. It’s royalty free. You get unlimited developer/site/client/machine licenses. You can use it in a commercial product. You can integrate the included source code in your own projects (subject to the MIT License). You don’t have to worry about renewing licenses or copyright. Isn’t that a relief? That’s it! Send the software library to your programmers. Your coffee’s not even cold yet. As you’re writing your code, SpreadsheetLight provides you with extensive documentation on its functions and parameters, so it’s easy for you. The idea is so you don’t have to trawl through tons of documentation if you don’t want to. * The documentation is in a CHM file. You might have to go to the file properties and choose Unblock under the General tab (in Windows) so you can view it. Have a minimum working blank spreadsheet with 2 lines of code. Alright 3 lines of code if you want to set a value. Save the spreadsheet as a file, or send it over the Internet (with ASP.NET). Strongly typed data parameters for setting and getting cell values. Support for date epochs of 1 January 1900 and 1 January 1904. Use one of 20 built-in themes, or create your own custom themes. Comprehensive support for styles from fonts to borders to gradient coloured backgrounds. Support for 47 named cell styles (the Good, the Bad and the Ug… I mean Neutral). Support for rich text formatting in cells. Hide and style rows and columns. Set row heights and column widths. Insert and delete rows and columns (and keeping the cell references of merged cells, formulas, tables and defined names correct). Sort data by column and by row. Conditionally format any cell range. Defined names (what is previously known as named cells and named ranges). Insert pictures, with extensive support for post-picture-insertion manipulations (including inner/outer/perspective shadows, colour fills, outlines, bevelling, and 3D rotations). Classes, functions and properties are documented in detail, so you can just explore without having to read a manual (even though a quick start guide is provided). Although the Open XML SDK assembly (DocumentFormat.OpenXml.dll) is included, it’s recommended that you install the Open XML SDK. The SDK is freely available from Microsoft. You can get SpreadsheetLight at just USD 400. With the documentation (in the XML file), you can also generate MSDN-like documentation for your own use. Or you can use this one. The C# source code is provided under the MIT License (see within purchase). Basically it means you’re allowed to use the source code in commercial projects. * Sign up with your email address at the end of purchase so I can send you the updates. I offer you a 1 year guarantee. Within one year of your purchase, if for any reason, you’re not satisfied with SpreadsheetLight, let me know, and I’ll give you a full refund. No harm, no hassle. Also, within one year of your purchase, you get unlimited technical support via email. Just contact me, and I’ll help you out with your problem. My goal is for you to get results. After your purchase is processed (you can pay with PayPal or your credit card), you will be sent to a download page where you can immediately download SpreadsheetLight. There will also be a form for you to enter your email address. Your email address will only be used to notify you of any software updates. Your purchase information (whether it’s PayPal account information or credit card information) is not stored anywhere on this site. Download SpreadsheetLight, and then enter your email address for notification of software updates. Thank you and I wish you smooth sailing for your software projects.